We're continuing the first week of our 31 Days of Wrestling series, and for day five, we're returning to the WWE once again. It was in May this year that all of a sudden, we got the news that the WWE was bringing back the Elimination Chamber special event as a Network-exclusive. On the May 18th episode of Monday Night RAW, Kevin Owens surprisingly showed up to answer John Cena's now-legendary United States Open Challenge, but he didn't actually wrestle him that night, stating he'd face Cena on "his own terms." Instead, he got permission from newfound buddy Triple H to face Cena at the Elimination Chamber event, and face him he did. Facing Kevin Owens brought out the inner Ring of Honor workhorse in John Cena, moreso than any of his other opponents with an indy pedigree. Owens, up 'til this point, was a master of heel wrestling psychology down in NXT; other than his very first match against the former CJ Parker, he had deliberately slowed down his wrestling style to emphasize his bully character. He was so good at it than even Melissa Joan Hart fell for it, criticizing him as a "lazy" wrestler. Owens and Cena pulled out all the stops in this match, wrestling a barnburner that would not be out of place in a Ring of Honor PPV. That's not necessarily a bad thing, as for all the ring psychology that was thrown out the window, it was a dramatic spectacle. It didn't hurt, of course, that a lot of the drama came from the suspense of finding out whether the WWE would even let Kevin Owens beat John Cena, of all people. This was a guy who didn't fit the traditional Vince McMahon mold on all fronts: he was not a WWE product (check), the vocal section of the audience that came from the Internet was behind him (check), and he definitely does not look like the usual WWE guy (check). It was a conflict the company and its fans would find themselves facing not just this year, but in recent years—should they take a chance on the indy guy? Will they let him go over? 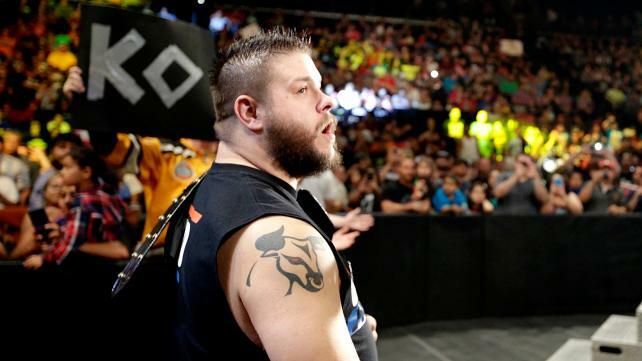 Knowing what we know now, though, the answer to the question is a mixed bag, a lukewarm reaction to Owens. Yes, he won that Elimination Chamber match—which is why this is the match we chose to highlight—but he would go on to lose the next match and the rubber match after it, just like the rest of Cena's up-and-comer opponents (with the exception of Seth Rollins). But now, Owens has some measure of success, being the Intercontinental Champion. That achievement may be due to the strength of his debut performances on the main show. We have a good feeling 2016 is going to be a better year for the World's Most Dangerous Dad.